Huh. Never thought he’d have a different colored outfit. The colors on Forak were the ones I always imagined. Cue someone showing me a pic of Atlas on a cover before that showed he was Green. Sorry, I never really paid much attention to covers. AFAIK, this is the first time we’ve ever seen Atlas in color. Well, I dunno about the RPG, but a quick trip through the Archives shows he’s never been on a cover. That makes both him and Emerald Gauntlet (Sr.) both primarily green in color scheme. Too similar. And where they’re two of the most premiere supers in the PS238 universe, does the two of them together make them the Green Team? I’d just like to point out the team-ups between Green Arrow and Green Lantern (Hal Jordan version). This ain’t Facebook- but LIKE. 😉 Good point. I though he had a light-blue to grayish color and a big red upside down V in the insignia with a red cape. Looking back I appear to have subconsciously been assuming he war the same general outfit as the guy on the cover of Second Contact. Had Ron remained a FISS, would his other powers emerge? Would he have been a “FISS Plus”? Or would his nascent powers remained dormant? If the latter, does that mean the emergence of one power set stops the emergence of other potential ones? I don’t think he has a spare set of powers. Me-thinks Power and Glory met with him by the bushes, and he slightly misunderstood them. They hinted he could get his powers back (by buying their stuff), but he thought it meant new ones will manifest. If I’m following the story correctly, it seems like Power and Glory are making money off former superheroes/villains by giving them items that mimic superpowers. Nope, it wasn’t Power & Glory. It definitely was Cecil. Cecil’s the only stated meta-detector in the strip atm, and he would know Ron from school, AND would know the situation. Power/Glory strike me as too…welll…mercenary to simply tell someone that for free, without giving them an invite to the shop to browse the merchandise. Perhaps they were just delayed. Earth-humans seem to have a scattered age range for powers to emerge. Most of the kids have had their powers for years, but Charles, who is older just recently started exhibiting them. It’s also possible, depending on what his new powers are, that he would have never noticed he had them if his FISS powers hadn’t disappeared. How would you notice you could levitate when you’re already flying? That sort of thing. I am half expecting him to develop X-ray vision, heat vision, and maybe super-speed from his human half, now that I think about it. Super-speed is already covered by FISS (Flight, Invulnerability, Strength, Speed). If Aaron was going that route, speed is therefore out thanks to the Argonite laser. My personal guess as to what Ron’s new powers will be are abilities that allow him to truly be Captain Clarinet rather than a FISS who who happens to likes to play the clarinet (even if his FISS powers + super-material clarinet = sonic blast ability). Self-criticism: it would be contrived, though, albeit poetic and delightful to Ron. I have a feeling some people here are NOT going to be happy with the revelation that some people actually have a spare set of heredity-based powers after their previous powers were taken away. They are going to be envious that someone else got a second try at the ring. Also: What’s to stop Lester from blabbing who’s who in the superhero community? He might have gotten a message signed with an Eye of Horus telling him why it would be a good idea not to. Even leaving the Revenant aside, he knows he’d be the FIRST one suspected if any identities leaked from this little group, and he’s on parole. I don’t think he wants to risk that. He’ll only blab if he thinks he can get superpowers sufficient to escape the consequences as his reward. How is that different between powers acquired by magical/technological artifact, loaned by magical/technological society, based on mutation (change in genes), etc. Lots of ways to get powers don’t care so much about the base state. It does make you wonder why a FISS hasn’t also bonded with a magical item plus brain-enhancing nanites and then been granted powers by the last of the Lemurians, etc. Such a combination power would be a seriously powerful super. Well to date the setting has been fairly simplistic, everyone’s been an archetype of various super types rather than more complex combinations like Wolverine (mutant+tech enhancement), and powers that aren’t uncommon in many settings seem rare to thought mythical in nature (like Cecil’s powers or the Messiah level of healer) in PS238. So no Atlas+Emerald Gauntlet sorts, probably no Amazo/Super-Adaptoid/Mimic sorts either. Looks like Tyler has an idea of who told Ron about that. Does he know that Cecil told Ron that? Considering Cecil’s the only one known to have that power and he’d given Cecil a cloaking device earlier that day it’s not like Tyler wouldn’t figure it out really easily. Omnius’s picture is fantastic looking. What’s the chances that we’ll get a version without the speech bubble or panel cutoff? I’d love to use it as a character picture in an RPG or something. Glove villain reminds me of a dark Emerald gauntlet. I alos think Ron is jumping to conclusions, as I’d guess his powers are in abeyance not destroyed. I don’t see a problem as Early Supes grew into his powers as a teen. The destruction of Ron’s FISS powers is permanent. The argonite beam that did it was designed to do just that. DEX-RA: I see I’ll have to speak with the castle’s ARTIFICIAL BRAIN. It assured me the effects of the argonite beam it designed would be PERMANENT. Someone being told they’ve lost their powers permanently means little in comic books where all it takes is the right kind of luck or someone with sufficient genius to reverse the effect. Look at Storm, Forge’s Neutralizer ‘permanently’ removed her powers, yet during the Adversary storyarc on a completely primitive planet he manages to put together a device that restores her ‘permanently’ lost powers. It’s not like we’ve any reason to think Dex-Ra asked whether or not the effects could be reversed and only asked if he could remove the powers ‘permanently’, nor is the computer brain that made the weapon infallible just because IT didn’t know of a way to reverse the effect doesn’t mean someone else couldn’t (like that super-AI the Argonians and Emerald Ones keep fighting over). Marie was specifically proposing that Ron’s powers were not lost but merely put into a state of suspension (“abeyance”). My answer- based on what the comic itself said, particularly what the mastermind and perpetrator of his depowering said- is that they are gone for good. We DO have reason to believe that such thoughts of the argonite laser’s effects possibly being reversible DID cross Dex-Ra’s mind. His plan to control Atlas and thus rule Argos are all DEPENDENT on Ron being his HOSTAGE. Ron is only vulnerable as an easily harmed softling. For him to gain back his FISS powers over time or through directly counteracting the laser’s effects would immediately jeopardize his scheme. And we have seen how careful, cunning, and manipulative Dex-Ra is. The assumption that he didn’t ask the artificial brain if the beam can be undone doesn’t fit the story or his character; however, the argonite beam’s effect’s permanence being also “irreversible” does. 2) getting super powers after a depowering, even if new powers come from a different source and are different from the ones lost. For #1, that’s what I just talked about. For #2, we’re now in a story arc about getting powers again. In fact, we already know Ron WILL be a metahuman once more, and the comic also states that whatever new powers he gets are likely from his mom, where his dad’s powers are gone. As such, yeah, Ron in the most general sense isn’t going to be normal forever. But the door to his being a FISS once more is, I believe, closed and locked, and it’s time for him- and for us- to move on. It was also noted by Dax-ra that the house brain was getting a bit senile. If he treated it the way he did everyone else it may also lie to him because it hates his guts. Kaian: At which point, Dex-Ra will pulverize it. Screwing over the plans of the powerful power-hungry only works if you’re safe from retaliation. And we do know Dex-Ra is vengeful since he still managed to get Ron and Moon Shadow into a “lost in space” scenario even after getting busted. Argh. Should have read and thought about the “senile” line more closely. Kaian: Dex-Ra says it after being confronted with the “failure” of the argonite beam. It’s not that Dex-Ra noted that the brain is finally going senile and thus the beam failed, it’s that the beam failed so Dex-Ra is speculating that it’s going senile as an explanation. Oh I get that he is assuming the senility. But based on potential failure, his lack of knowledge of hacking their cameras, and even the spacing guild willing to inconvenience him just because he is a jerk. I say Ron’s original powers might come back or come with others. Hard to tell. It’s also possible that Ron’s half-human heritage may have left him less vulnerable to a weapon that was presumably developed based off of the biology of pure Agrosians. Argonite affects all FISS, including human ones (84). The laser would thus work on any FISS potential from Ron’s human mom as well. I really doubt the “potential failure” part. Ultimately, there’s nothing in the story and its details that indicates the beam could have failed by itself in any particular manner. Dex-Ra and his artificial brain said it was designed to be permanent; note the feat of turning a particularly radioactive synthetic rock into a freakin’ beam weapon. Ron’s arrival on earth as a depowered FISS is immediately followed up by the Cecil saying he’s still not “normal”. Lastly, note the character struggles and development of Ron and how it has changed because of all this. Whether from the perspective of a character in the Ps238-verse or from the writer’s/story perspective, Ron’s story and character development is moving away from being the son of “Superman” to something else. For him to regain his FISS powers brings us back to the FISS part of the PS238-verse with Ron in the same place as before; this is redundant in the face of his character history and of the previous story arc. To me, everything indicates that it’s time to move on. Ron becoming a FISS again just isn’t that, particularly given his own experiences, sufferings, failures, and hopes. That is NOT good for Cecil, even though Ron doesn’t know who it was it alerts more and more people to the existence of a super-human who can detect those with super-powers or the potential for them. 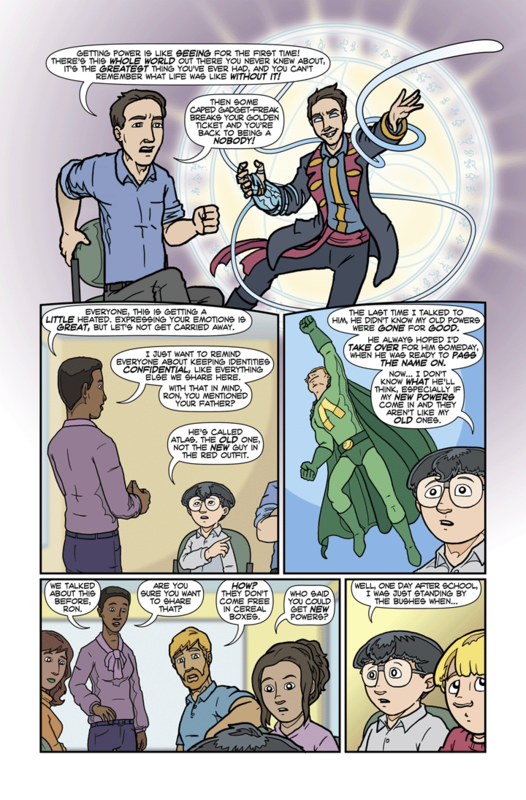 Given how the original Rainmaker program was set up AND how the government created Argonite specifically as a weapon against Ron’s father (and I’m sure that they loved finding out that it worked against the FISS package since they’re the most common super-power set) them learning that it’s possible for someone to detect super-humans is not good for Cecil or anyone else with super-powers. The headmaster would find it a valuable recruiting tool. However, the folks that would have the most to risk are those who’s identity is secret. Of course, it seems in PS238, many supers seem to be open with their status. Can I say I really like Super Jerk’s outfit? It kind-of reminds me of Oz from Use Sword On Monster. I think it’s the hair and the shape of the face, combined with just a hint of color scheme and fantasy-styling. Sure. I think Leser is a [censor: donkey] (just to keep things here family-friendly), but he IS a villain (or ex-super villain) and Aaron didn’t do a bad job with his design. I agree. I’m liking Super Jerk’s super villian outfit also. Non-sequitur: when the Captcha gives me [blank] + eight = sixteen, I really want to feed it its own medicine and try ‘eight’ or ‘VIII’. I wouldn’t say that, you find yourself effectively waking up to senses you never had before, things you can’t truly explain to anyone because as pointed out in Grrl Power the language simply doesn’t have the words for explaining how it feels when you unleash an energy blast or can feel everything around you as if it was part of you. You can now interact with the world in ways you couldn’t before, like the blind man gaining sight. You can now do what you wanted before but couldn’t, either good or bad. It’s unsurprising that hero or villain it would be devastating to go from the equivalent of being able to see and hear to being blind and deaf only worse. Frankly it’s a good thing that they do have therapists to help supers who’ve undergone this kind of trauma, the last thing you want is someone driven to desperation to try and regain their powers or new powers no matter the cost. Unless something actually grows or emulates new areas of the brain for people, “new” senses overlay or piggyback on existing senses. Extra brain functions are possible in a super world, but even then I bet it is rare. Psychedelics like LSD may crosswire senses (see also https://en.wikipedia.org/wiki/Synesthesia) but they don’t grant new ones. Other things may overwhelm or block senses or even brain functions, and different abilities may expand current senses, but truly new ones are not feasible on standard brain-ware. Senses that tend to be mostly unconscious could serve the same purpose. If your proprioception started to pull in information about the relative position of things that aren’t part of your body, it would likely feel like an entirely new sense. Yeah, powers don’t come free in cereal boxes. NOOOOOOO!!!! (whimper) Another bit of old childhood fun being ruined. Really?!? Wow. That’s a bummer. But then again, I never really liked Cracker Jacks. So I guess I can’t complain too much. Methinks this might be a bit of an advertisement for Power and Glory, Inc.
Just the place to find something to replace those lost powers and abilities.